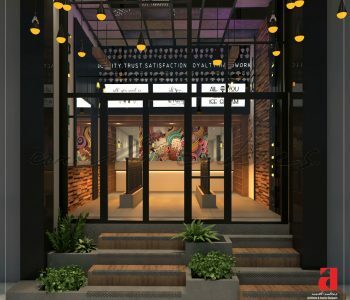 The project takes a fresh approach to the meaning of an ‘Ice cream Parlor’ that for our qualified team of Interior Designers is meant to represent a ‘HAPPY PLACE’ to make the user sweep away into a magical realm of design deliciousness. Located right in the heart of the city, the plaza is designed to facilitate preparation of the best sundaes in town that have speedily gained popularity because of its unmatchable taste. 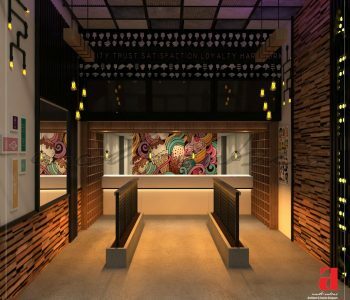 On the ground floor is this ice-cream parlor that is deliciously decorated in hues and graphics that evoke the customer’s beloved ice-cream flavors. The colorful place has a sort of retro feel with neon colors adorning the walls that represent the wide range of flavors offered from classics like chocolate and strawberry to more adventurous like coconut. While the clean palette of white in the counter and ceiling is meant to create a balance and harmony in the space. The bright lighting is created to provide more stimulation and energy in the space so that the customer is alert and active while they experience it. The purpose behind the bold interior is to attract children and adults alike with its adorable decor and colorful icy treats. With all sorts of funky but sensibly chosen interior elements, the space is designed to make the user feel like they’ve stepped into their ‘Utopian childhood dream’. It is meant to enhance the imagination in choosing just the right flavors for their ‘Sundae’. The intention was to communicate the ‘brand catering diverse clientage’ through design and the result is as flawless as the products on offer. The place is meant to draw attention of all kind of passersby no matter what age or background with the use of funky mix of materials and graphics and the bright accent in the colors.